Presents instructions for drawing a variety of birds, including barred owl, great blue heron, and ruby-throated hummingbird, along with information on choosing tools and creating textures. 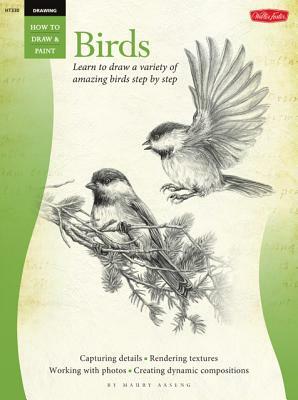 *Author: Aaseng, Maury *Series Title: How to Draw & Paint *Subtitle: Learn to Draw a Variety of Amazing Birds in Pencil Step by Step *Publication Date: 2013/03/15 *Number of Pages: 32 *Binding Type: Paperback *Language: English *Depth: 0. 25 *Width: 10.25 *Height: 13.50. At UnbeatableSale.com, we have the largest selection online and the best prices. Our low price guarantee assures you that you are getting a competitive, low price on this great Drawing By Aaseng, Maury. This item is currently available for the everyday price of $10.28, a discount of 5% off the list price. UnbeatableSale.com offers domestic shipping options for your convenience and even ships to many international locations. At UnbeatableSale.com we are committed to protecting the privacy of our customers and using personal information responsibly.